The different master programs in psychology each have a master committee and so does the master Clinical Neuropsychology & Cognitive Psychology and Psychophysiology. The committee organizes a variety of activities for master student of this program such as an open day at the Neuro Imaging Center. The committee members are free to decide which activities to organize. When organizing an activity, the committee will come in contact with people working in the field. The four master committees of VIP together also organize a study related activity, which often is in the form of application training, and a social activity. As mastercommittee Brain & Bahaviour we would like to introduce ourselves in this way! We are the brain behind the activities for the masters Clinical Neuropsychology and Cognitive Psychology. The brain behind the activities consists of four very well connected and succesfully working together parts. These parts of the brain come with certain kind of behaviour, ready? Here they come! First of all we've got our Frontal lobe. She's good at planning, structuring, solving all our problems and directing the committee in the right way. Meet our chairwomen: Lisan! A chairwomen is nothing without a right hand, therefore we've got our temporal lobe. She remembers everything by writing it down and thereupon always names and recognizes anything! Temporal lobe of our committee is our secretary: Vera! Also important, the parietal lobe. She's got visuospatial insight and is amazing with numbers. She keeps track of all our expenses. 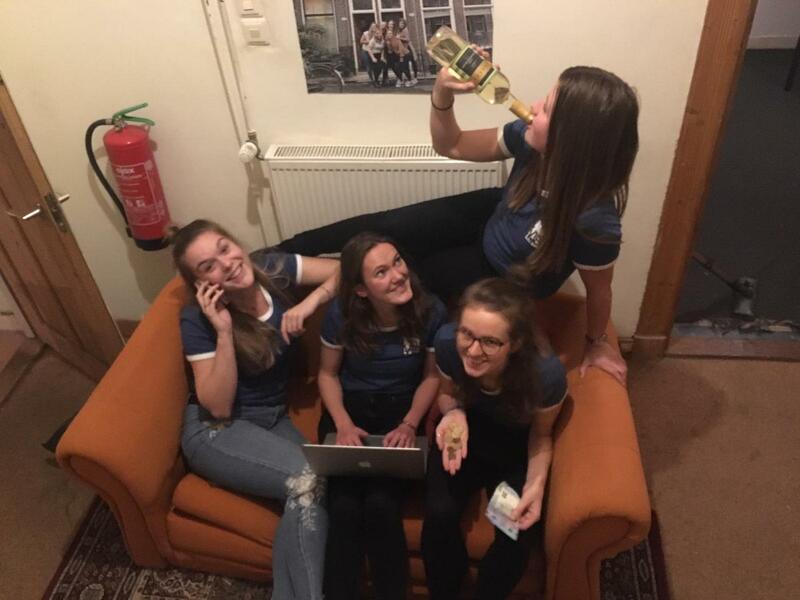 Making sure four girls won't spend to much is a hard job but she's doing great, our treasurer: Elske! Last but not least, the occipital lobe. Makes sure she sees where the social contacts can be made, shows up everywhere and externalises, our external contacts: it's all in the name, Lisanne! We hope to see you around at our activities this year!